Art Tuesday – Art is Much Less Important than Life, But What a Poor Life Without it. How Have You Benefited from Art? Art is much less important than life, but what a poor life without it. Robert Motherwell. I have always believed that art is an important piece of the puzzle of life. Without art, I would not be complete. 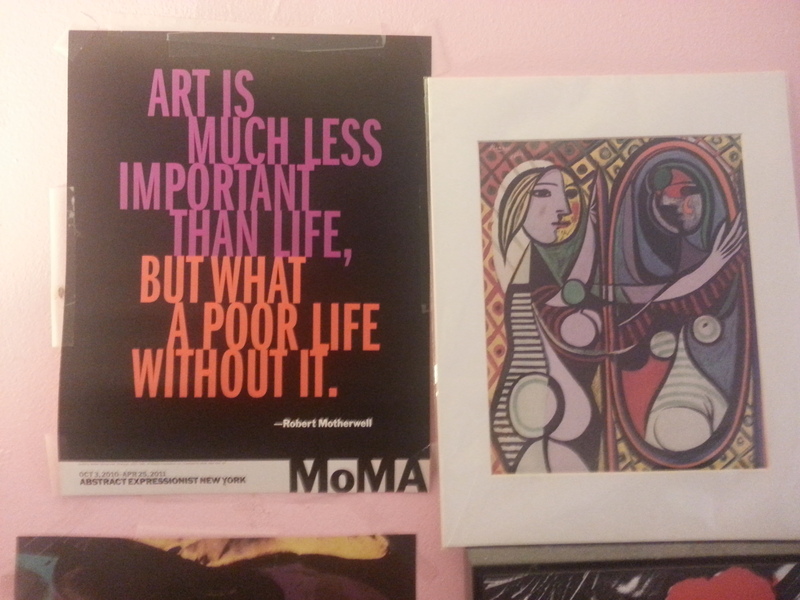 (Two of many posters/images on my wall) Quote by Robert Motherwell (on the left) Copyright MoMA or Museum of Modern Art. 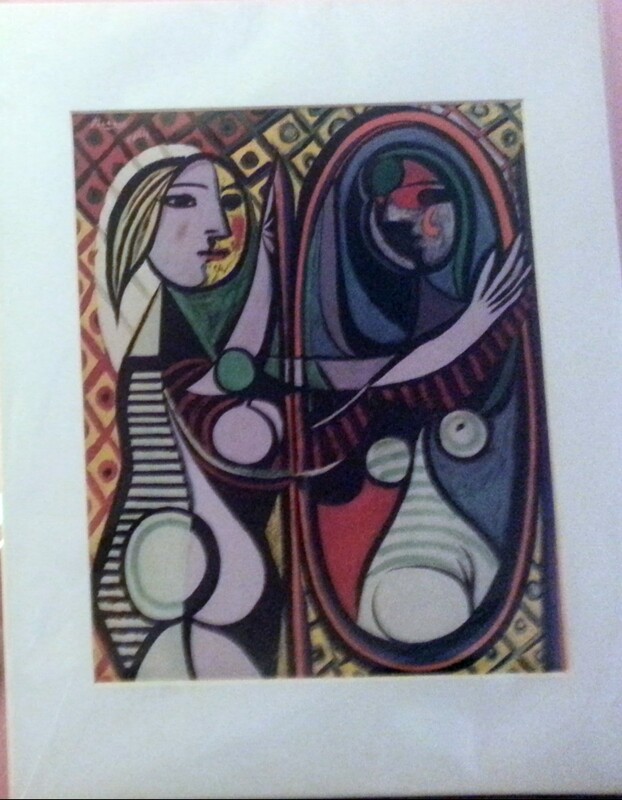 From their Abstract Expressionist New York Exhibit Oct 3,2010 – April 25, 2011; (On the right) Pablo Picasso’s “Girl Before a Mirror” Also, purchased at the MoMA. 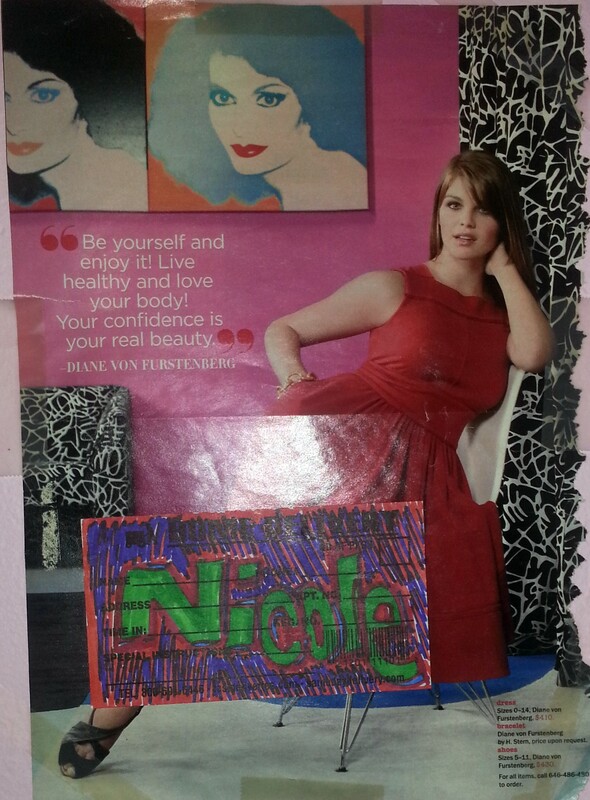 Art has been a major influence in my life in a lot of ways. Not simply visual art either. Artists (visual and musical), paintings, music, film (also directors and screenplay writers), animation, writers like Maya Angelou (bless her soul and her beautiful poetry), even some clothing designers (You go Diane Von Furstenberg! ), have all inspired me in some way. Even to start writing this blog. 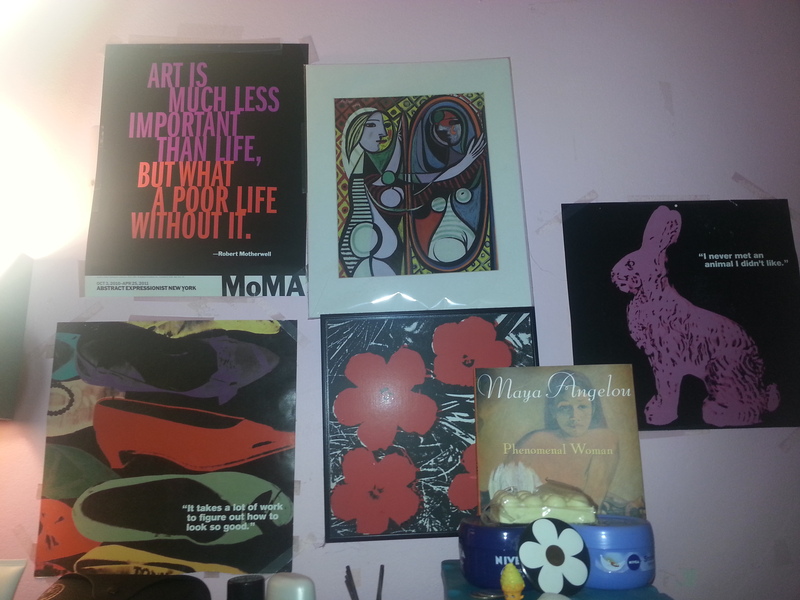 When I look at the walls in my room, it’s easy to see how art has been an inspiration to me, even though recently I have hit a bit of a wall with my creativity. I’ve always been willing to try new things when it comes to art, as far as exploration and discovery go (in one’s art that is). But it seems whenever people tell me that they do not like some of my work, I take it too harshly. Should I or shouldn’t I? Nevertheless, I still draw and paint to my heart’s desire. Until recently, I was not too good with words. Creating visual art was my sole escape. Keyword was. I still enjoy drawing and painting, reading, writing, going to museums whenever I can. However, life has caught up with me and has become more serious. I especially struggled after I was rejected from a film program I yearned to be a part of ever since I fell in love with film: the ultimate visual art in my opinion, because it encompasses all aspects of visual art, but also utilizes music and dialogue (in modern cinema of course). Art is my escape from reality because art does not force you to have an impression or experience you do not wish to have. Certainly, artists have intentions for their work when they create them. But experiencing art encompasses everything you have ever seen. Depending on your point of view, you will see something different from how I do. Also, creating art is a unique experience in itself as well. People have tried to describe the process of creating art. But it is not the same for everyone. To me, “Girl Before a Mirror,” connects with my insecure side. When I look into it, I see myself looking into the mirror and think about how I pick apart myself and my flaws. But it is fair to say that this was not even close to what Pablo Picasso was thinking while creating this piece. Or while deciding on which colors to use, the shape of the woman’s breasts and hips, etc. He may have simply been fascinated with a woman’s habit of peering into a mirror. Picasso had more than a few women in his life. In the past, when I read about Picasso’s life and accomplishments I was fascinated about how he lived. He and the people he lived amongst revolutionized cubism during their own lifetime. Imagine doing that during your time alive? One could only hope to accomplish as much or even half of what Picasso did during his own lifetime. To be so successful, that your grandchildren do not have to work. If you do not believe me, google his grandchildren. He probably made most of his wealth after he died, and sure, he had his flaws, but can you say you are perfect? 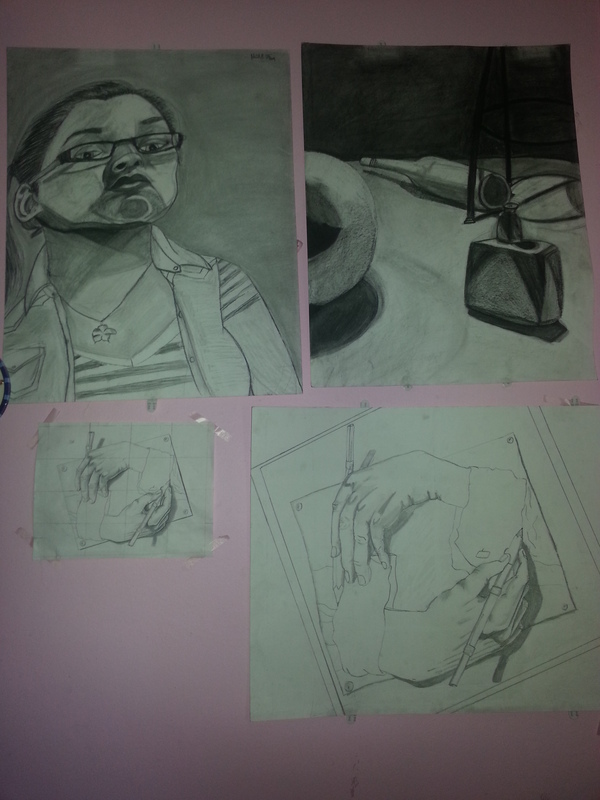 Drawings by yours truly **Original Artworks Created by Nicole Oliva and Image by Nicole Oliva** (Top left) Self-portrait 2013; (Top right) A Still Life 2013; (Bottom right) Two Hands 2013 (Blown up version of the image on the bottom left) All original works that are shown here were created for a drawing class. I do not think I could give a definite answer to that question but in my opinion, my art reflects my life. Sure, I have tried to redo some Picasso pieces. So in that literal way, I replicated art and was influenced by it. But I have always been an observer. Not necessarily a follower. Following this line of thought, some people may entirely imitate art, but the ones who revolutionize, their art imitates life. Not the other way around. I believe all great art imitates life. Even abstract art. Abstract art in itself is a complex puzzle not meant to be solved. Just like life. Why are we here? I do not have an answer to that question either. Are we here to live and then die? What should be we do while on this Earth? What if we all have a purpose that is meant to be fulfilled? Have I fulfilled that purpose yet? 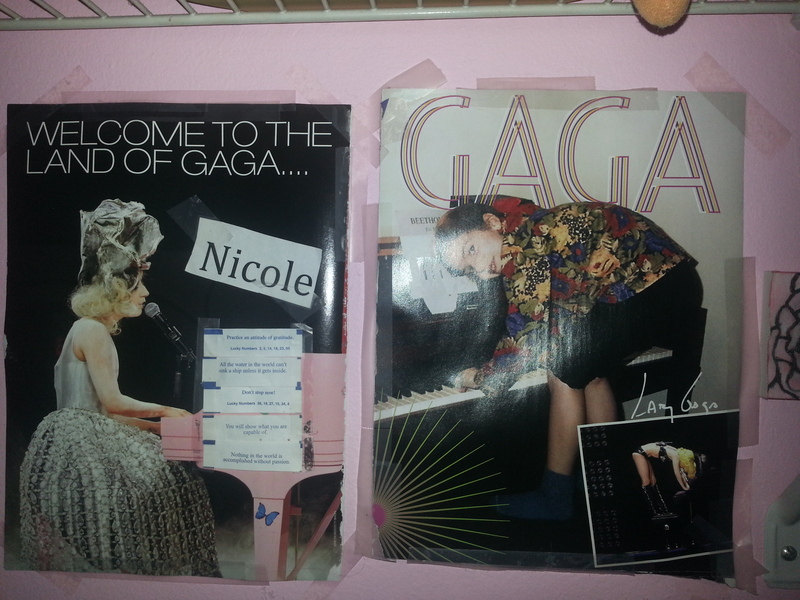 More pictures on my wall lol. Pictures of Lady Gaga **Image by Nicole Oliva** Original images taken from a magazine. Copyright goes to original owners or photographers. If you read through older posts on the Gaff Blog, you’ll see one post that mentions Lady Gaga, who is another great influence in my life. Say what you will about her. But her music, whether she was high while writing it or even making the beats certainly imitates her life. From Bad Kids to So Happy I Could Die, to Monster, if you dig deep into her lyrics, you can see the real her. Even Poker Face is apparently about her hiding a bisexual fantasy from her lover. The rawness of her music is what always attracted me to her as an artist. Also, her love of playing piano always inspires me to bring an aspect of what I love into my future work and career. Although her taste for leather repulsed me during my vegetarian phase, I accepted her for her flaws. Some may think she has more than others. But again, we’re all imperfect. Artists may simply be more attuned to accepting their flaws. To end this post, I will say that art has continued to be an immensely beneficial aspect of my life. If art has not benefitted you in any way, I suggest checking again. On your walls, on your clothes, maybe some place that I wouldn’t even think of. But find what makes you happy and pursue that, whatever way you can. National Hot Dog Day 2015: How Do You Like Your Hot Dog?